Today i upgraded my device driver 417.35 -> 418.81. I did clear install. 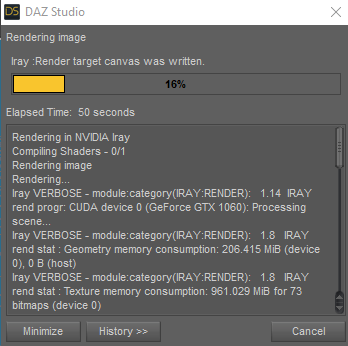 After Daz didn't want to Iray render with GPU only CPU. Have someone this problem or not? I install back 417.35 and work all fine again! Have you checked that the graphic is checked for use in rendering, in renders settings > advanced? I saw wrning on web about that gpu drivers they have issue with iray. Just skip them. I just wanted to ask someone to have met this one. I leave the new driver, older work fine. It's my fault, i checked only the system memory not the VRAM. 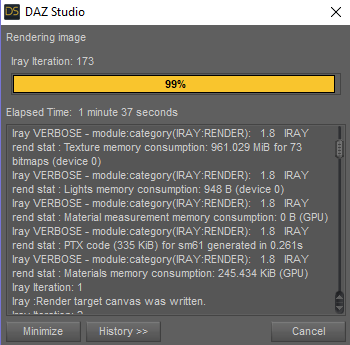 When preparing render and the system memory run out the limit (16GB) rendering is interrupted. So I just look at this. Probably this is bad, but it has worked so far. This say VRAM 4,5GB right? This values are while rendering? Then you're not rendering with your GPU, 'cause "GPU Load" is at 3%, would have to be above 90%... and GPU Core Clock/Memory Clock are lower... seems that used memory from GPU (4564MB) is used by other program, have you opened some other program while rendering? Have you switched to the simplest view in viewport in DAZ? BTW, I think that when you reach your max RAM system, windows uses your HDD as RAM (slower), so make sure you have free space on your disk (usually if you haven't changed it, the C ... I recommend 30GB free minimum. I've have 75GB free space in SSD. Windows and Daz3D installed here. 1. run only daz without scene. 2. scene loaded one character. I suggest to check "OptiX Prime Acceleration", and uncheck "CPU" in "Interactive Devices". Issues with the new driver, I also had them and so did other people that posted in the Daz forums. I reverted back to the older driver and now it works fine. Gonna wait a while before I update again. I'm still at 417.01. It works and I will not touch it, no GeForce Experience, no Telemetry or automatic driver update BS enabled. The same with Windows 10 updates. Currently old build 1709 installed. Win 10 was installed shortly after launch, automatic updates disabled using W10privacy, only did one manual update to 1709 once. After all the drama about people have their data deleted in "some cases" with the last W10 update I'm glad I did that. Always make sure to read the changelog, especially the open issues section. It was first mentioned in the 418.91 driver changelog and has been fixed in 419.17. Unfortunately there where some API changes lately which often results in a bugfest and it takes a while to iron them out.